Yet another village in Southern Estonia with its own commieblock area. Entering from the road. Surprise! I hadn't seen any such renewing of a block before. This is local social house or house for elderly. Wheelchair access on the side. Couldn't miss my dear friend. 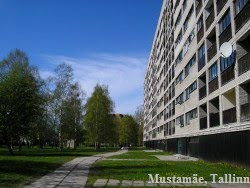 Most enjoyable architecture from soviet time!